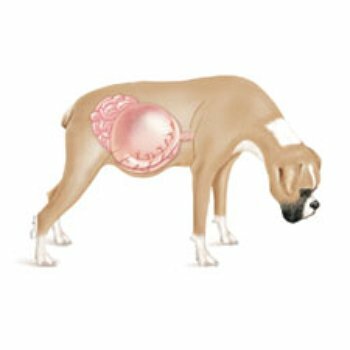 Every dog owner should be aware of the dangers of dog bloat (GDV), as it can kill your dog within hours, sometimes minutes if you don’t go to the vets quickly enough. When it happened just over 2 years ago to my Westie, I was totally ignorant of what dog bloat is, the symptoms or the fact that it is life-threatening. Consequently I was totally un-prepared – my dog lived fortunately, although he was very poorly and kept at the vets for 2 nights under supervision, and the first night the vet said it was touch and go as to whether he would pull through. I will never forget it happening and the worry about my poor little dog- he is now more at risk of getting it again, as all dogs are who have contracted it before. So, at least read this, become familiar with the symptoms and be prepared in case it happens and also take some preventative measures, as I had to do after it happened to Dougie to minimise the risk of him bloating again. Bloat is what happens when food is not digested properly, causing gas to build up in the stomach so quickly that the stomach literally blows up like a balloon, stretching the organ so much that normal circulation of blood to and from the heart is cut off. The trapped gas cannot escape. The stretching itself and the lack of blood to the stomach’s cells can cause cell death, or necrosis. In severe cases the stomach actually “twists and turns” (known as volvulus) at the top near the esophagus and at the bottom of the stomach at the pyloric valve. Gas is trapped and can’t escape as a burp or the other end as “passing wind.” The gas builds and builds as it becomes trapped within the stomach. The stomach grows so big it cuts off circulation and irreversible damage is done to the cells. The dog goes into shock and then cardiac arrest. This can happen within several hours after the onset of bloat. When Dougie contracted bloat, of course I knew he wasn’t well, as he wasn’t behaving as normal but not being aware of bloat, I didn’t know he needed to go to the vets until he had already suffered for a few hours. He was very restless, drinking a lot of water, whining occasionally,very quiet and tried to be sick quite a few times with nothing but foamy stuff coming up (similar as when they’ve eaten grass). Within minutes of me ringing the vet for advice, Dougie’s condition worsened quickly, with him collapsing and crawling to try and hide behind the sofa. You are probably thinking why didn’t I notice his swollen stomach ? That’s what I keep asking myself but I’ll tell you it was not obvious at all. 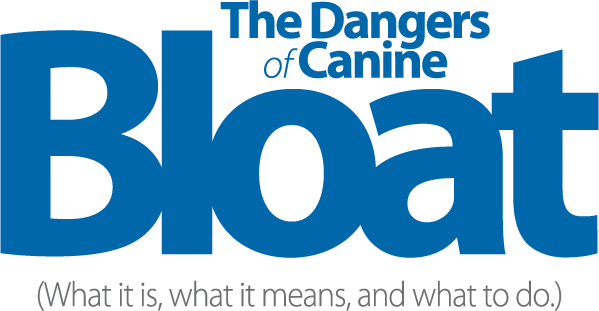 Click here for the full list of symptoms of bloat My dog had enough of these well-known symptoms that had I been aware of them, I would have taken him 2 hours earlier to the vets. If you suspect your dog is bloating – take him to the nearest vet as quickly as possible, keeping him warm. Keep a handy note of your vets number and also a 24 hour emergency vets as well as taxis who take dogs – my car was having it’s MOT and I had a terrible job finding a taxi company who would carry a dog, especially a sick one. 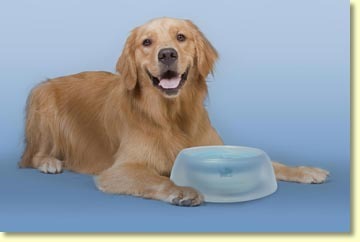 All slow-feeder dog bowls are different and we tried out 2 other brands before keeping these Alpha Paws Eat Better and Drink Better dog bowls. 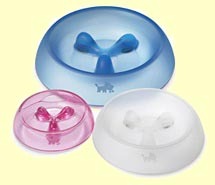 We found with other brands that because the separators stuck up vertically, short-snouted dogs had difficulty getting any food without getting poked in the eye with the protrusions – these slow-feeders are ergonimically designed for comfortable use. I hope that my experience will hopefully ensure that others are at least more prepared to deal with bloat if it ever happens.